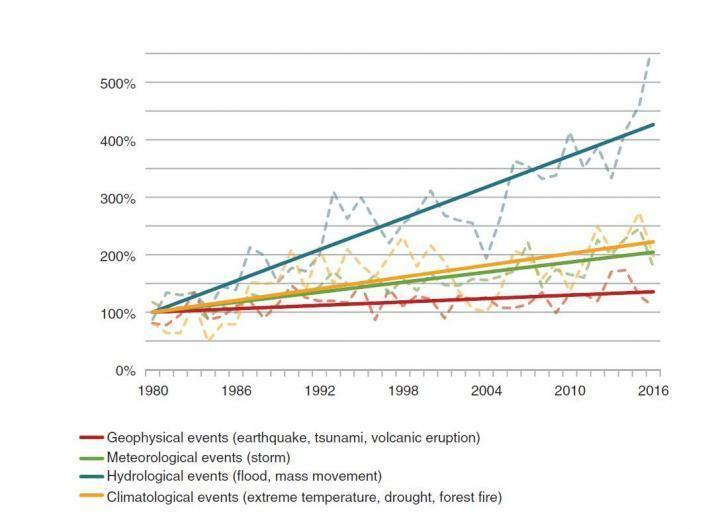 Trends in different types of natural catastrophes from 1980 to 2016. Extreme weather events have become more frequent over the past 36 years, according to a new study that calls for increased urgency in European efforts to adapt to climate change. The study was released Wednesday by the European Academies’ Science Advisory Council, which is made up of the 27 national science academies in the European Union, Norway, and Switzerland. The study found that hydrological events, such as floods and landslides, have quadrupled worldwide since 1980 and have doubled since 2004. It also found that climatological events, such as extreme temperatures, droughts, and forest fires, have more than doubled since 1980. And it found that meteorological events, such as storms, have doubled since 1980, the council said in a statement. The study, “Extreme weather events in Europe: Preparing for climate change adaptation: an update on EASAC’s 2013 study,” was an update of a 2013 report by the council. In a study last month, the council had also called for rapid reduction of greenhouse gases. The study said there had been a “significant uptick in floods and other hydrological events compared with even five years ago,” the council said. The extreme weather events carry substantial economic costs, the council said. It found that losses from thunderstorms in North America had doubled from under $10 billion in 1980 to nearly $20 billion in 2015. It said that debate remained ongoing on whether the Gulf Stream will decline or just switch off because of climate change. A shutdown of the Gulf Stream, which brings warmer ocean water from the Gulf of Mexico to warm Europe, could have major implications for the continent’s climate. The study also noted recent studies that suggest a link between the rapid Arctic warming and extreme cold events to the south, including in Europe and the Eastern United States, because of changes in the jet stream. “Some of the underlying drivers of extreme weather which were speculative four years ago are now looking less speculative and are now credible hypotheses: That’s the weakening of the Gulf Stream and the meandering behavior of the jet stream,” Norton, who is also a science engineering professor at the Tokyo Institute of Technology, said in a statement. The “latest scientific trends suggest we must take these possibilities seriously and continue to pin down the time scale and the extent of the changes involved,” Norton said.